For the launch of the initiative against arms exports to civil war countries, we are looking for 25,000 people, each collecting 4 signatures. Do you help? I would like to be informed about new initiatives and referendums. The Federal Council wants to export weapons to civil war countries with immediate effect. This decision violates Switzerland's humanitarian tradition. This is unacceptable! We are therefore looking for 25,000 people who are willing to collect 4 signatures each against this decision. When we reach this goal, we jointly launch the Correction Initiative! Are you there? Switzerland already supplies war material to countries responsible for numerous civilian casualties - Saudi Arabia, for example, is complicit in more than 6,000 dead children in the civil war in Yemen. 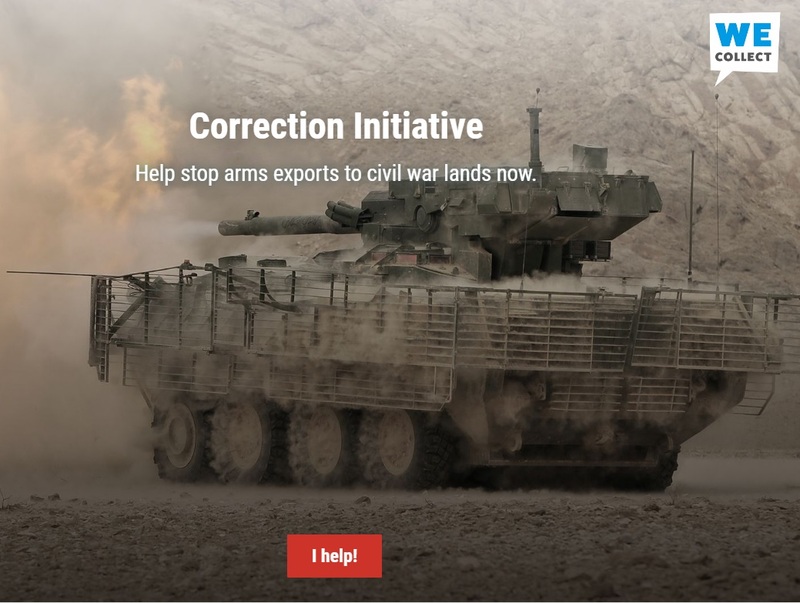 But the Swiss defense industry is not enough: it also wants to supply civil war countries legally with war material. The Federal Council responded to this request at the beginning of the summer. He also wants to authorize weapons deliveries to countries that are involved in «internal armed conflicts». He now relaxes the approval criteria - without a previous democratic vote in parliament. Already in 2014, the war material regulation was relaxed: At that time, the parliament decided to export weapons to countries that seriously and systematically violate human rights. Our goal is to undo these two decisions. So it's about restoring the status quo from before 2014. For this reason, the "Alliance against arms exports to civil war countries" launches this appeal. The alliance consists of people from different parties, church circles and relief organizations. Support us! Attention: This is the text submitted to the Federal Chancellery. There may still be editorial changes. Large parts of the initiative text correspond to the war materiel ordinance in force today (Art. 5). The Confederation issues regulations against the misuse of weapons, weapons and ammunition. It issues regulations in the form of a federal law on the manufacture, procurement and distribution as well as on the import, export and transit of war material. democratic countries with an export control regime comparable to Switzerland. Countries that are involved in conflicts only under a UN mandate. there is a high risk in the country of destination that the war material to be exported is passed on to an unwanted final recipient. By way of derogation from paragraph 3, the law may provide for exceptions for individual handguns and handguns with their ammunition provided that the weapons are used exclusively for private or sporting purposes. If the relevant statutory provisions do not enter into force within three years after the adoption of Article 107 (2), (3) and (4) by the people and classes, the Federal Council shall issue the necessary implementing provisions by ordinance; These apply until the entry into force of the statutory provisions. The Alliance against Arms Exports to Civil War Countries is an independent association that includes several individuals from politics, relief organizations and church organizations as members. The club is being co-chaired by Beat Flach (GLP), Therese Frösch (President Helvetas), Martin Landolt (BDP), Lisa Mazzone (Greens), Priska Seiler Graf (SP), Thomas Wallimann (Justitia et Pax) , Lewin Lempert (GSoA), Marianne Streiff (EPP) and Johannes Bardill (Reformed pastor). Other relief organizations and organizations support the alliance. These include, for example, Amnesty Switzerland, SWISSAID, Terre des Hommes, the Evangelical Women Switzerland, Public Eye, WeCollect and the Swiss Peace Council.